The Allders department store chain has been put up for sale by property firm Minerva. Minerva said talks were at an early stage, but interest had been received from the Allders management team and other potential bidders. Allders currently operates 45 stores, 25 of them High Street department stores and 20 stand alone Home Stores. Minerva also said that it was still in talks over a possible offer for the whole company. The property firm had reported in July that it had received a takeover approach for its whole business. Allders was bought by Scarlett Retail Group - a consortium led by property group Minerva and investment bank Lehman Brothers - for about £162m ($316m) in 2003. Former BHS chief Terry Green was appointed chief executive at Allders following the takeover and has led a reorganisation of the chain. Store layouts have been revamped, stock has been changed, prices cut and a whole new buying team brought in. However, the retailer has continued to struggle amid ever fiercer competition on the High Street. When Minerva released results in September, Mr Green said that "the speed with which this transformation has been effected has had an impact on the short-term profitability of the business". Minerva said that its share of the Allders business had produced a loss of £22.6m for the year to 30 June. City analysts believe several leading retailers including House of Fraser, Debenhams, Next and US business GAP might be interested in Allders. Richard Ratner, a retail analyst with stockbrokers Seymour Pierce, told the Press Association that Mr Green and other executives might struggle to raise the funds needed to buy and invest in the business. "We believe that Scarlett is still loss-making, albeit not at the same level as last year," Mr Ratner added. 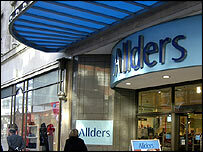 Allders employs 8,000 staff at its Croydon headquarters and its stores across England.